The storm clouds referenced by Mr. Meat Loaf are Signs of the Last Days, the Time of Tribulation preceding either the Coming of the Lord or the Ascension of Marvelous Mit(t) Romney, depending on which translation of the Bible you prefer. Modern scholarship is now leaning to the latter interpretation, since it is generally acknowledged that the King James Bible was not translated correctly. This new modern interpretation, based on recently unearthed documents written in Reformed Egyptian—which was the original language of God—has been bolstered by other Signs of the Times. Besides the recent “Frankenstorm” that was a clear sign of the Lord’s displeasure with the administration of Barack Obama, there was the duet performed by Marvelous Mit(t) and Mr. Meat Loaf at a campaign stop in Defiance, Ohio. According to Biblical prophecy, the Last Days will be ushered in when “the Lion lies down with the Lamb, and when Meat Loaf and Mit(t) Romney sing ‘America the Beautiful’ at a fundraiser somewhere in Ohio.” Incidentally, the relationship between Mr. Meat Loaf and the Marvelous One goes back several years, ever since the rock legend found out that Mit(t) would go into a hellish sweat just thinking about eating Mrs. Mit(t)’s delectable meatloaf. 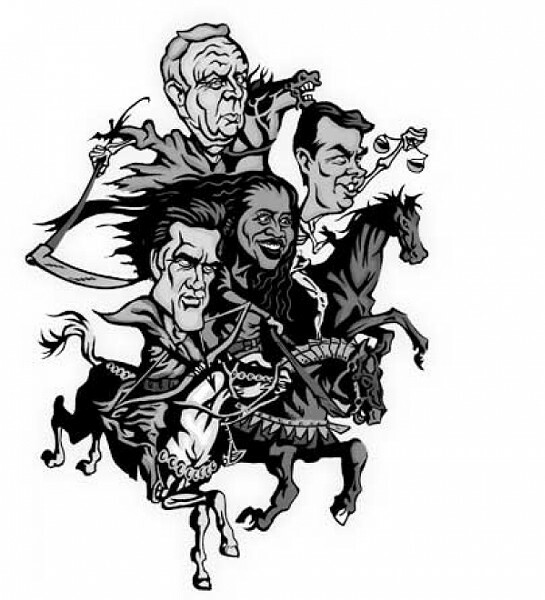 The third and most significant sign of the Apocalypse occurred during the under-publicized appearance of Utah’s favorite political saviors at yesterday’s Halloween festivities, when they galloped through Salt Lake City neighborhoods dressed up as the Four Horsemen of the Apocalypse: Conquest, War, Famine and Death. I am referring, of course, to Marvelous Mit(t) Romney, Uncle Orrin Hatch, Sister Mia Love and the boyish Elder John Swallow. Homeowners had the bejesus scared out of them when the four trick-or-treating Horsemen of the Apocalypse (technically speaking, Three Horsemen and One Horselady) came roaring and snorting down their street. Leading the charge was Marvelous Mit(t), holding on for dear life as his White Horse (actually his wife’s dancing horse, Trigger, painted white) bucked and reared, apparently spooked by kids wearing Snooki costumes. Mit(t), confident of victory in next week’s election, appointed himself Conquest, the only righteous rider of the four. Uncle Orrin was not at all happy to be riding the pale (in some accounts, green) horse, signifying Death. Though they represented Famine and War, Sister Mia and Elder Swallow were just happy to be along for the ride and all the free candy. “Famine, shmamine,” said the Elder, swallowing a Tootsie Roll. Uncle Orrin slowed things up a bit when he kept demanding laxative gel caps instead of Kandy Korn or Butterfingers. Elder Swallow, who used to work for a diet supplement company, had to keep reminding the forgetful senior senator that he had boxes and boxes of laxatives, as well as bottles and bottles of snake oil, stored in his blast-proof survival bunker. Should Marvelous Mit(t) prevail in next week’s election, he has vowed to ride Trigger all the way to Washington, stopping occasionally to touch up the white paint on his wife’s talented dancing horse and hose down the family dog riding on top of his oversize head. At long last, the White Horse prophecy, first enunciated by the Prophet Joseph Smith and repeated down through the ages by various and sundry General Authorities—including Brigham Young and Glenn Beck—will be fulfilled. The Constitution will no longer be “hanging by a thread”; the deadbeat 47 percent will be cast into outer darkness and our Republic will be restored to its prelapsarian glory. Should the Marvelous One somehow fall short in the coming election, all hell, including Mr. Meat Loaf, will of a surety be loosed upon the land.